One of the country's biggest experiments in electric vehicles is about to be launched, not by Uber or Tesla, but by AAA, the straight-laced organization best known for its auto insurance and roadside mechanics. Starting early next year, a fleet of 260 shared electric cars will appear on the curbs of Sacramento, the capital city of California. They are part of AAA's plan to stay relevant as electric, ownerless and self-driving cars begin to upend the norms of road transportation. "The opportunity here is to reach a younger audience, a new generation of members," said Jason Haight, the president of Gig Car Share, as the service is known. The average age of a AAA member is 55. AAA is formerly known as the American Automobile Association. The service builds on the early success of a similar offering in the nearby San Francisco Bay Area, but with gas-powered cars. Launched a year and a half ago, that service has since doubled in size to 500 cars. The average age of its users is 31. Still, moving to electric compounds the difficulty of what is already a difficult business. Several companies have tried to marry electric cars to shared cars, and most have failed. Cushioning those hardships for AAA is that someone else is picking up much of the tab. The electric fleet is being purchased for AAA by Volkswagen AG, the German automaker, as part of its penalty for cheating on diesel emissions. Gig Car Share is a partner in VW's $44 million "Green City" initiative in Sacramento (Energywire, Aug. 7). AAA is facing membership challenges as younger drivers begin to abandon the idea of owning their own cars. The new initiative comes from the nonprofit's Northern California club. "Over the last 5 years we've added 1.6 million members to the club, but full disclosure, that increase predominantly comes from expanding from three states (Northern California, Nevada & Utah) to 7 states (we absorbed the Arizona, Wyoming, Montana and Alaska clubs over that span)," wrote Michael Blasky, an AAA spokesman, in an email. And with automated vehicles (AVs) promising to appear on the streets soon, the shift away from car ownership is likely to accelerate. "They're looking to diversify, come up with new business models," said John Gartner, a transportation analyst at Navigant Consulting Inc. "With AVs, people won't need to be calling AAA. That's a loss for them. So they're asking, 'What can we do?'" What AAA is doing is laying several stakes on the new wheeled landscape. It is a collaborator at GoMentum Station, a 5,000-acre test track for autonomous vehicles in the Bay Area, and has lent the weight of its brand to a cube-shaped, self-driving shuttle that plies a circuit around the casinos in Las Vegas. All of these are run by A3Ventures, an "innovation lab" spun out of the club two years ago. Funding comes from its traditional businesses: memberships and auto insurance. AAA doesn't divulge if its new operations are profitable. The staff of about 50 works in a rapidly gentrifying warehouse district near the Oakland waterfront, in an office with the exposed brick, glassed-in conference rooms and whiteboards that are de rigueur in Silicon Valley. 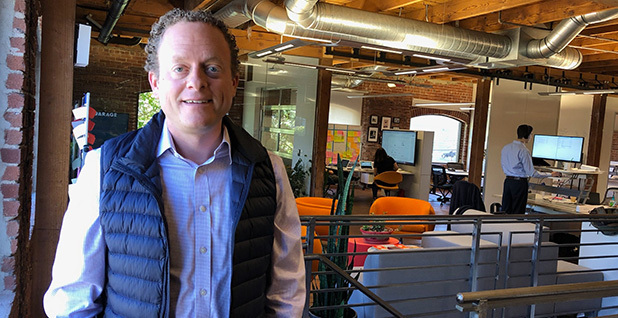 And, like a startup, it has ambitious expansion plans, with a plan to move soon to a space three times the size, nearby in downtown Berkeley. AAA is entering a crowded and confusing car share market. The first thing to know is that Gig isn't like Uber, which for many people is the definition of car sharing. For one, its cars are owned by Gig, not by drivers. 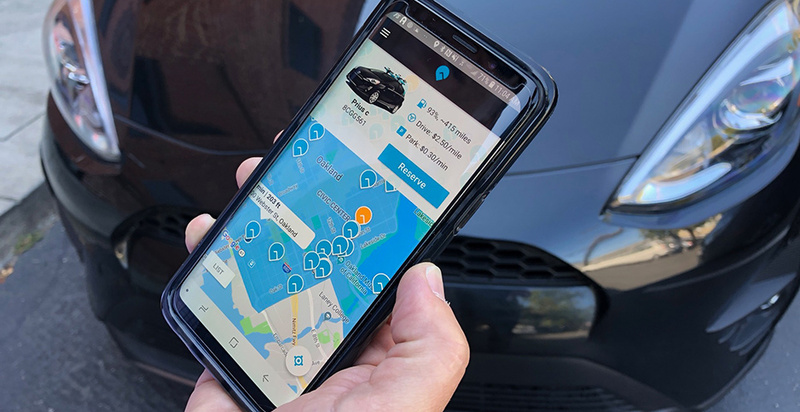 Second, the autos have no assigned driver; they are parked curbside around a city, and are located and reserved by a driver through a smartphone app. That driver uses an app to unlock the car and start the engine, and after using it, parks it on the street again for the next user. People in some metro areas — Chicago, Seattle, Washington, New York City — are familiar with this model, which is called "free-floating car share." Gig operates in four Bay Area cities, including Berkeley and Oakland. As it prepares to move into Sacramento, it is also pressing for permission to operate in San Francisco. Users are charged by the mile, the hour or the day, whichever is cheapest. Its inspiration? Gig patterned itself on Evo, a service of the British Columbia Automobile Association, which was started in 2015. AAA Northern California's CEO, Tim Condon, used to lead BCAA. Gig is mostly a carbon copy of the Canadian service, including its pricing structure, its car model (the Toyota Prius C hybrid), the color (black) and the bike rack on the roof (Thule brand, blue). In the United States, Gig is in a competition of sorts with two of Germany's largest automakers, Daimler AG and BMW. Car2go (in D.C. and Chicago) is Daimler's; ReachNow (in Seattle and Portland) is BMW's. Or rather, they were; in March, the automakers merged the two services as a 50-50 joint venture. Together, the fleet will encompass 20,000 cars in 31 cities worldwide. In a statement, the carmakers called it "our ultimate commitment to dynamically scale mobility." This competitive landscape makes it especially interesting that Gig has aligned with Volkswagen, Germany's other large carmaker. VW plans to offer 20 models of fully electric cars by 2025, and has also announced that it will launch an all-electric car-sharing service in Germany next year. To date, car sharing and EVs have been a mismatched pair. Uber, for example, has done trials of electric cars, only to find that their limited range and the length of time to charge them have been major obstacles for drivers (Energywire, June 11, 2018). Two years ago, car2go abandoned an EV service in San Diego because it couldn't find enough places to charge its fleet. Another effort in Indianapolis, BlueIndy, was forced to scale back last year after facing resistance from business owners who resented its chargers taking up curb space. Car-sharing fleets can be a logistical nightmare, said Gartner, the Navigant analyst. Since drivers can leave cars anywhere, the fleet owner is obliged to reshuffle them daily, either with a squad of drivers or with flatbed trucks. "It's really tough to keep after the vehicles," he said, "and especially if it's EVs" that have to be constantly recharged. The emerging solution: bigger batteries, and faster and more ubiquitous charging. ReachNow, which counts electric BMW i3s as 10 percent of its fleet, is building a network of 20 fast chargers in Seattle. For charging, Gig will rely on public chargers, including the 10 or more "charging depots" that VW is in the process of building around Sacramento. As Gig serves drivers who don't have a car, it must keep an eye on another sort of rival: cars that don't need a driver. Several deep-pocketed companies — including Uber, Waymo (the self-driving arm of Alphabet Inc., the parent company of Google), Lyft and General Motors Co. — are laying big, if gradual, plans to move people through cities in shared, self-driving electric cars. And — in an example of how overlapped the new world of autos is — Gig's EV may be the Chevy Bolt by GM. That's the word from Will Berry, a Sacramento representative for VW, which is paying for Gig's vehicles. Under the terms of the consent decree that settled VW's diesel scandal, it agreed to create a brand-neutral platform for EV charging. Gig says that it hasn't yet settled on a car model. Policy nerds will appreciate that a key ingredient in the success of Gig and its competitors isn't the quality of the car, the hustle of its leaders or the quality of its technology. That's because drivers need to be able to park in any neighborhood. And without a special permit, any car-sharing fleet would be bankrupted in a blizzard of parking tickets. "City partnerships are one of our most important priorities," Haight said. "It takes a progressive-thinking city planner to do it." The free-floating services have pioneered a new sort of "super-permit." 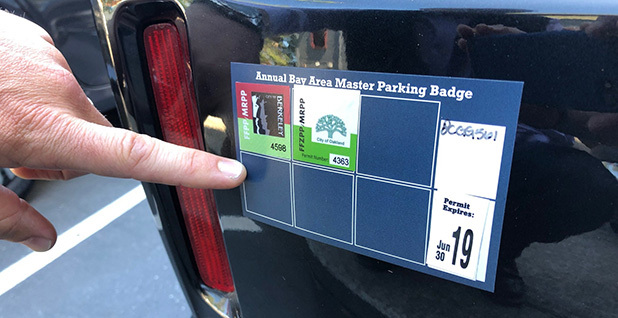 It's a sticker that overrules the limits on parking meters and neighborhood zones, though parking in a handicapped spot or a loading zone is still a no-no. Gig is the only holder of such a permit in Oakland or Berkeley. In Sacramento, the city council passed a resolution creating such a permit last month. Those same rules put ironclad geographic boundaries around free-floating car share. Drivers have to start and conclude their rides in the "home zone," as Gig calls it. If a driver breaks parking rules outside that zone, the fines and tows are on the driver. AAA's other forays into mobility are no less bold, if smaller in scale. In Las Vegas, it is a sponsor of a shuttle that makes a driverless circuit downtown. The cube-shaped, bidirectional bus made a short debut in early 2017 during the massive International Consumer Electronics Show. It got into a fender bender with a truck on its first day — an accident later blamed on the truck driver — but went on to carry 20,000 curious riders over a week and a half. "Seeing that type of support and enthusiasm from the public, we said, 'Let's take this further,'" said Joanna Wadsworth, a civil engineer with the city government who oversees the project. Now it runs a half-mile loop, on busy streets, intermingling with other cars and going slightly slower than the posted speed of 25 mph. The eight-passenger cube has carried more than 28,000 passengers since starting last November, Wadsworth said. AAA had provided funds and manpower, paying for the project's operation for a year and staffing the stops with AAA workers to manage the lines and answer questions. The operator is Keolis, a French transportation company that operates several public bus lines in downtown Las Vegas. The vehicle is made by Navya, another French company. "AAA definitely has been around for a long time. They have a very good reputation as an auto club. It has brought awareness to the project, and I think when people come here and they see the shuttle and they know that AAA is involved, it brings a — I don't want to say comfort — but a comfort level that AAA is involved, too, from a safety perspective," Wadsworth said. Wadsworth said the city, while it has no specific plans, is considering AVs for circulating services downtown. For AAA, facing a sea change in transportation, these experiments are nothing less than necessary. Within a decade, it expects half of its income to come from its new products. "We want to be head of the curve," said Blasky, the AAA spokesman. "You don't want to think about this when you're starting to lose money."